February 13, 2016, 10:36 PM · On Friday, November 15, 2015 I received a call from John L. He is a contractor who has thrown a great deal of work my way over the past 15 years or so. Most of this has been orchestral, interspersed with a number of weddings - and the occasional funeral popping up at the last moment. When he began by asking me if I were free that coming Monday morning, the 16th, I assumed by the short notice that it was a funeral. But I was not even close. It was to play in a tv commercial! I was in the middle of a busy period in my freelancing, so I looked in my appointment book to make sure I could be free. Fortunately I found only a dental appointment for that day. Hmmm…keep a painful dental appointment or cancel it and do a commercial? That no-brainer took about half a millisecond to decide! Through talking further to John and then to the producer he put me in touch with, I came to understand more about the nature of the commercial and what was expected of me. It was to be a commercial for a bank. The idea they wanted to convey was that you, the customer, had better things to do than take up too much time in a bank, such as pursuing the things you love – in this case, music. 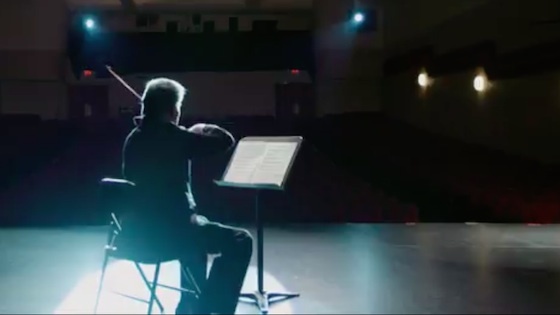 The director had come across and had taken a shining to the Bach prelude to his first cello suite – and yet they wanted a violinist to play it. No problem! I have an arrangement for violin of all the cello suites. But what I needed to do was extract exactly 30 seconds from it, to fit into the commercial’s 30 second time allotment. I started with the first several measures and then made a reasonable cut I to the climactic final measures. Over the course of my busy weekend I practiced my excerpt a few times and showed up on Monday at the Algonquin Theater in Manasquan, New Jersey, wearing a tux and armed with my violin and the music. I arrived early, chatted with the production team and started to warm up. I wasn’t very nervous but I was just a tad uptight at first. After all, this wasn’t something I did every day! The team was friendly and professional but I had a sense that we were communicating in a friendly way, but across a classical/non-classical divide. We broke the ice a bit when they asked me if I had ever done a commercial before. They were pleasantly surprised that I had. Back in the ‘80’s I did a commercial with Tony Bennett for MTV. But I was part of a large group that sync-played to a pre-recorded synthesizer track. They were also pleased to hear that I had made a video with Rascall Flatts – though that was also as part of a large group. Today’s project was to feature only me. I would play the Bach excerpt and be seen as well as heard throughout the commercial. We began by my running the excerpt while they timed it. Unfortunately, it ran 45 seconds. I had to quickly figure out how to musically lop off another 15 seconds. I cut off another 2 or 3 more measures in the beginning section and we tried it again. This time it somehow came to the required 30 seconds! The next phase was for me to record the excerpt. There would be no editing here. I simply recorded the excerpt in its entirety 4 times in a row. For the rest of the shoot I had to play it over and over again, even though they were no longer recording it. While I did this, they filmed me from every conceivable angle, lighting and distance, with cutting and stopping to change cameras and lighting. They also took many still shots for eventual print ads. A jest here and there did help leaven the focused work we were all doing – but focused, it was. Playing it over and over after the recording was done, I didn’t have to worry about, say, intonation. But as far as humanly possible, I had to play the same way each time – for we were coordinating visuals to something pre-recorded which of course, would not change – and I didn’t even know which recorded take they would choose. Every tenuto, every accelerando and ritardando had to be the same. I tried my best. I think I took direction well and contributed just a bit to the process. Around the middle of the shoot they wanted to shoot me taking my violin out of the case. This is actually the opening scene in the final version while you hear me already playing – a nice effect! I immediately got that it was a good idea but said that I think I should first remove some of the stuff from my case before we shoot, as it might take too long and seem too fussy. So you won’t see my cleaning cloths, etc. In 2 or 3 takes we nailed it! Towards the end they asked me to do yet one more take but rather than remain seated, I should get up and take a bow. We nailed that in one take! So in case you think that I was too proud of myself, the bow was their idea! The last phase was the most unusual one for me. They asked me if I was familiar with a helicopter camera. I was not. It turned out to be a kind of drone with a camera attached. Not much more than a foot square, it had four propellers on top and a small camera in front. They fired it up, and blue and red lights started to blink. It seemed like a little UFO! Then it started to lift off and fly all around the theater! I asked the director if the CIA knew about this. He chuckled and said “they WISH they knew about this!” Actually, I don’t think it would be very good for stealth work, as it made quite a racket – kind of like a power lawn mower. My last task was to go back to my seat, play my excerpt again and again till they told me to stop, while the drone camera would fly all around and above me. This was a surreal experience: Here I was playing Bach while a noisy little UFO flew over my head, all the while hoping that it wouldn’t fall on me and kill me – or worse, hurt my precious violin! After a while the director said “that’s a wrap”. We actually finished the whole shoot ahead of schedule – in under two hours. I said my goodbyes to the crew, packed up my violin and headed to a nearby Chinese restaurant to treat myself to a fine lunch and think about this unusual morning. Since this is a commercial, perhaps I should make a disclaimer that I neither necessarily endorse nor not endorse this bank. I was simply a hired performer to do a gig. But what an interesting gig it was! Click here to see the finished commercial. February 14, 2016 at 07:14 PM · Raphael really interesting experience, thanks for sharing this story with us, and great to see (and hear) you in the final video! February 15, 2016 at 07:40 PM · Thanks! February 15, 2016 at 10:04 PM · What an awesome experience that must have been. Thanks for sharing! February 17, 2016 at 02:13 AM · Thanks for sharing with us,Raphael. You're a class act and I enjoy all of your witticism on this board. February 17, 2016 at 04:06 AM · Thanks, folks!